Ok...the blatantly obvious thing....man it's fast....like BMW XR1000 fast, so I was very careful to keep the front end down (£500 excess for any damage!). The seat is hard (I'm getting old I know!) 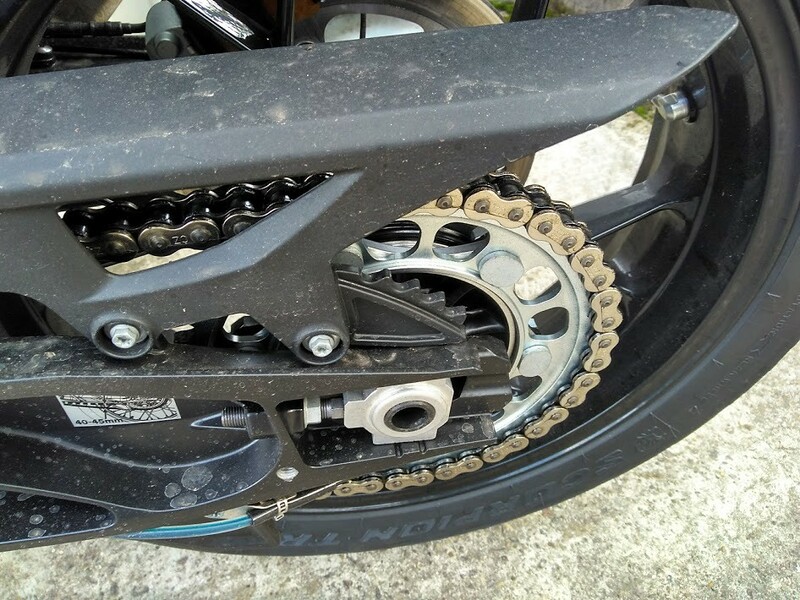 and it dives under braking, though not as bad as the BMW F850GS I have also ridden recently. The KTMM's TFT screen is great, the bike rides nicely and has awesome brakes...Oh and did I mention is was ballistic fast ? Sounds like he was impressed! Which would have been fine if the rear brake spring loop wasn't pushed hard into the frame (spotted on day of collection...resolved by the dealer with a judicious use of some pliers and a heavy dose of black paint) and then a week later the all-singing all-dancing LCD screen throwing a hissy fit a week before I went on holiday (resolved by a replacement part....having the dealer 3 miles from work is a big improvement to the 80 mile round trip to BMW earlier in the year). 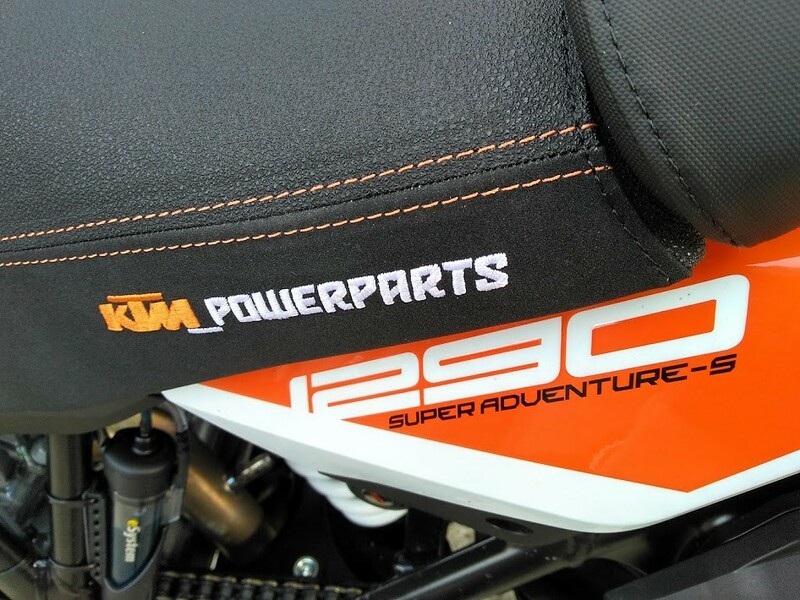 In general they have pretty accommodating in resolving the issues and even collecting the bike, but as a new KTM dealer I think that there will be improvements to come. So apart from these glitches...the miles have been racking up. The overwhelming impression is this thing is fast (as noted on the test ride), ludicrously fast that I have found myself actually laughing out loud in my crash helmet....way beyond raising a smile that the BMW would induce to a maniacal grin that is hard to shift. However, buying a bike when most of FWB's are putting their bikes in the garage for the winter means that the opportunities to exploit the speed have been few and far between (the ride from the dealers on collection day involved a string of damp, diesel washed roundabouts populated by the retarded locals...it was entertaining! ), let's hope the summer is similar to the last. What I have noticed is that it won't pull 60mph in top gear (unlike the BMW)...just means I'll have to ride a bit quicker and overtake everything in sight ! The (now functioning) TFT screen is fab, nice and clear lots of legible info, customable for info you want to display (oil temp. 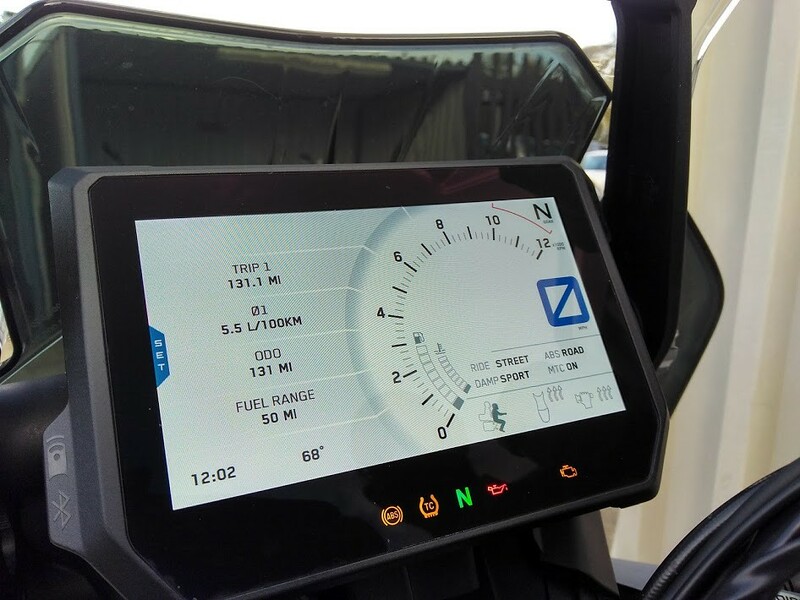 TPMS to two decimal places, multiple trips etc)...I reckon its better than BMW's one on the new GS just for layout and info. The reported switching between day and night mode occurs on mine but seeing as currently I go to work in the dark and return in the dark, its not affecting me much. We'll see what its like in the spring/summer, but whichever mode it's in doesn't affect its legibility. Other things that I have notice is that the screen is good deflecting most of wind off my 6 foot frame, the bars are slightly narrower than the GS (good for filtering), the tank shape means I don't get wet luv spuds when it rains, the heated seat is an indulgence that was worth the extra pennies (its required, the stock seat is like sitting on a plank with my boney a$$), it hasn't been turned off since November and the lights are epic (even if you ignore the cornering function) and the switch gear feels a bit more substantial than the GS. Its also much easier to clean than the GS, I think its down to the alloy wheels being a more sympathetic to using a sponge rather than my wire wheel brush that I had to use previously. Niggles....apart from those in the first couple of weeks issues.....I still get cold pinkies despite the fitting of the hand guards and heated grips (also there's no dedicated button for it meaning you have to go through the menus on the screen), the foglamp switch is positioned so that you cant reach it when you're riding (WTF...will need fixing in the summer) and there's a drumming at low rev's that comes and goes...the dealer can't trace it but its niggling at me, thankfully, I cant hear it at speed but I think its going to be a summer strip down and the application of some NVH foam. Other than that I am reasonably happy with the quality and quirky styling (and the fact that I've escaped from the BMW matrix too ! )..I'm growing to love orange and the dealer has been helpful with trying to resolve issues. Servicing is at 9k, so I should be on for one over the summer (and another change to ride their 790 Duke demo bike....yehhaaa...) and is reasonably priced and the Scorpion trail tyres are ok even if at 3k they are starting to show the winter commuter profile...square), I'll probably change back to Pilot Roads when the set needs changing but I'll check with the resident tyre guru first for any better products. Bike to bike, they are very similar, the GS was easier to ride slowly but I am happy to for-go that the acceleration of the KTM and the fact that its not a ubiquitous GS. Time will tell on the robustness and reliability, but as I'm racking 1200 miles a month its not going to be long before I have a "high mileage" (ie more than 3k pa) bike. Am I happy that I chopped the GS for the KTM ? 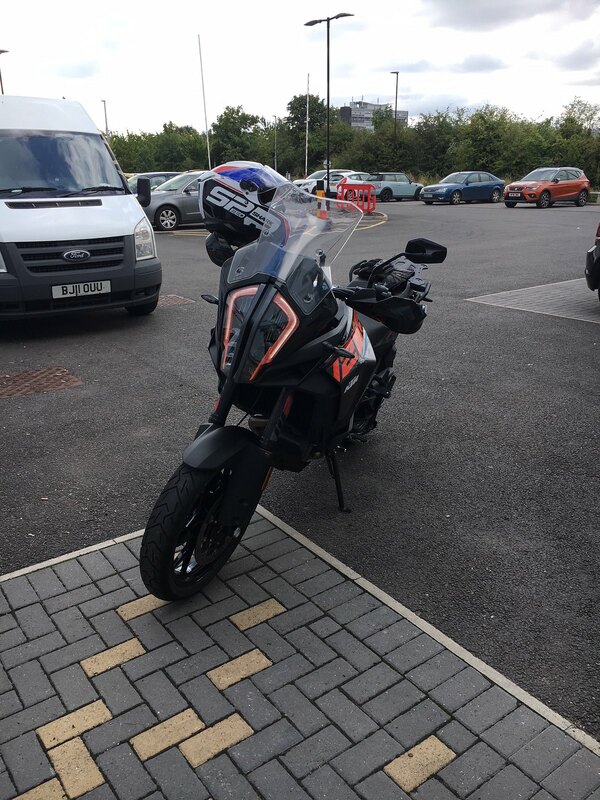 Well...the GS's px price was a kick in the balls coupled with the depreciation, but I have to balance that with the issues with brakes and the continual trawl to Wolverhampton (to try and get it resolved) and the great price on the KTM...on the whole its a good move. I could of held out for a better price on the KTM by waiting until it go much colder but that would have increased the chance of me running into the back of some one ! It is a chunk of change isn't it??!! !